The greater trochanter is the “large bony bump” that projects out of the proximal (near end) of the femur. You can feel where the greater trochanter protrudes by rubbing the area where a cowboy’s holster would rest. The most lateral bony bump felt by your hand over the side of your hip would be the greater trochanter. This bony prominence is the area of insertion of multiple muscles that move the hip joint. Immediately adjacent to the greater trochanter is a thick flat tendon that passes directly lateral to this bone. This tendon is called the tensor fascia lata (TFL) and connects muscles originating on the pelvis to the outside of the knee. The greater trochanter produces significant pressure on this tendon. The body has ingeniously developed a bursa (a frictionless sack) between these two structures to prevent this friction. The greater trochanteric bursa is essentially a thin water balloon filled with a very small amount of oil (synovial fluid). The two outside walls of the balloon are frictionless when coated by this synovial fluid. The surfaces of the bursal “balloon” rub against each other, eliminating friction and preventing pressure from developing. Like any other part of the body, this bursal sack can occasionally cause trouble. The walls of the bursa can thicken, become irregular and the oil inside can become sludge-like. This is all due to inflammation. Trauma, overuse, infection, prior hip surgery and metabolic disorders can all cause this bursitis (inflammation of the bursa). Repetitive motions of the hip (cycling, running, weight training) can also lead to greater trochanteric bursitis. If greater trochanteric bursitis is present for a prolonged period of time, calcification of the bursa can occur or the muscle insertions can ossify which can be demonstrated on an X-ray (see images). Most episodes of greater trochanteric bursitis however are not apparent on X-rays. The symptoms of GTB are lateral hip pain made worse with activity and pain that is increased by lying on the side of the inflamed bursa. The pain can occasionally keep the patient up at night. If progression occurs, the hip can ache without activity or pressure. The bursa will be tender to palpation and rare crepitus (a feeling of unevenness) can occur with hip motion. Interestingly, disorders of the spine can refer pain to this region, mimicking greater trochanteric bursitis. This is a common referral area for L1-L4 nerve compression and lower lumbar spine disc and facet degeneration. Hip disorders (arthritis and labral tears) can also refer pain to the lateral hip region. (Click to Enlarge) MRI of left greater trochanteric bursitis (arrow) This view is a cut through the beltline. The white area is inflammation. (Click to Enlarge) Greater trochanteric bursitis. Compare the right side of the picture to the left side. 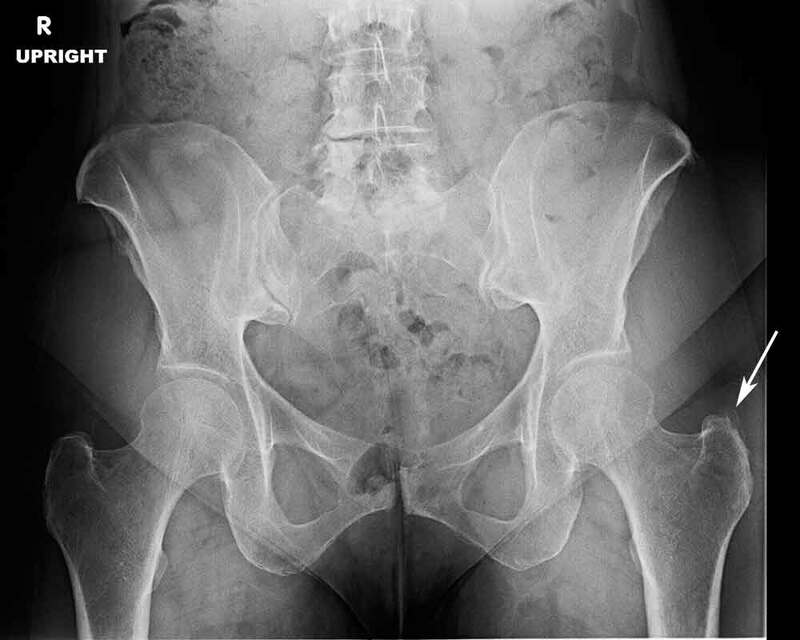 Note the right side lateral hip region is whiter than the left side. White=tendonosis. (Click to Enlarge) Note the ‘fluffy bone’ just outside the greater trochanter (arrow). This is new bone formation from tendonosis. Are you suffering from symptoms of Greater Trochanteric Bursitis? Initial treatment is reduction of activities, NSAIDs (Motrin, Aleve) and a walking aid (cane or equivalent) if pain is severe. Physical therapy is used to stretch the tendon and provide palliative care (ultrasound, hot/cold and iontophoresis-medication driven into the bursa through electricity) and electrical stimulation. If symptoms are severe, a steroid injection can be provided directly into the bursa in the physician’s office. The injection can be curative but generally will give relief measured in months. A repeat injection might be indicated for return of symptoms. Finally, if nothing seems to give relief, a surgical bursectomy (removal of the bursa) can be performed. This procedure can be performed through an arthroscope. The surgical success rate is high. For additional information on greater trochanteric bursitis, please contact the office of Dr. Donald Corenman, spine specialist and back doctor serving the communities of Vail, Aspen, Denver and Grand Junction, Colorado.